I love animals. I always have. From my earliest years all I ever wanted was animals. I loved visiting zoos, wildlife parks, petting zoos and seeing animals in their natural state was an absolute pleasure. I loved coming home to my pets. I loved playing with my stuffed animals and my animal models. My favourite board game growing up was the 1960’s Wild Life game; a game recommended by the World Wildlife Fund. When I left home I took that game with me. During my many moves I lost it and was devastated. But, thanks to the internet, 25 years after I lost the game I managed to find one in England. The day it arrived in Australia was one of the happiest. So many of my childhood memories were there in that one box. And yes I have played it again and again! Although I loved all animals, one thing I didn’t have was a favourite. I wanted to have one so I tried ways of picking an animal that would be my favourite. As a vampire fan from a young age I formed a bond with Dracula’s animals – the wolf and the bat. 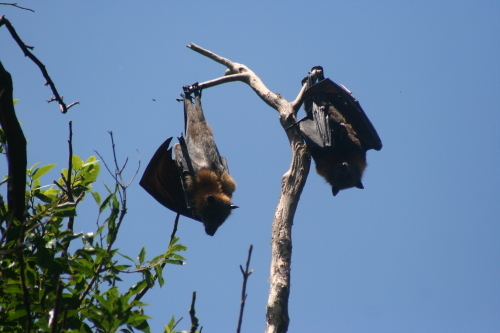 We are lucky to have fruit bats in Melbourne that fly through the night sky, just like bats in a Dracula movie. 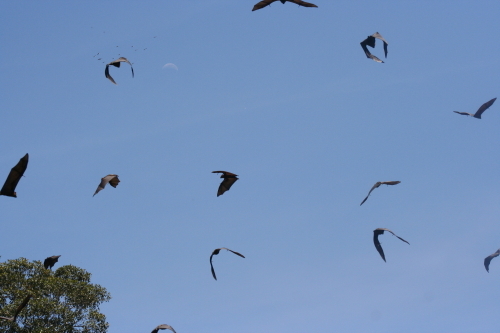 One of the local parks has colonies of bats that you can visit during the day. If you go there at dusk you can see them wake up and get ready for their nightly flights. Many an evening has been spent watching these magical creatures. It was a colony of bats living in the trees of a caravan park I was staying at in Sydney that inspired me to create the Dracula Tarot! In Western Astrology I’m a Taurus and my animal is the bull. I researched bull and cow mythology which is quite fascinating. But while I liked them as animals, I just couldn’t bond with cows or bulls on a spiritual level. I had a bit more luck with my Chinese animal sign which is the snake. Snakes are extraordinary animals mythologically. They are so extraordinary that I’ll be doing a separate post on their mythologies 🙂 But I will mention that snakes are linked to vampires – especially Dracula – which makes them very special to me!! 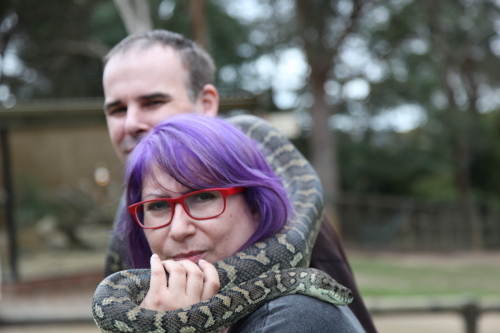 is that a python on your shoulder? While I couldn’t find a favourite animal I found two that are very special to me; the red panda and the puffin. 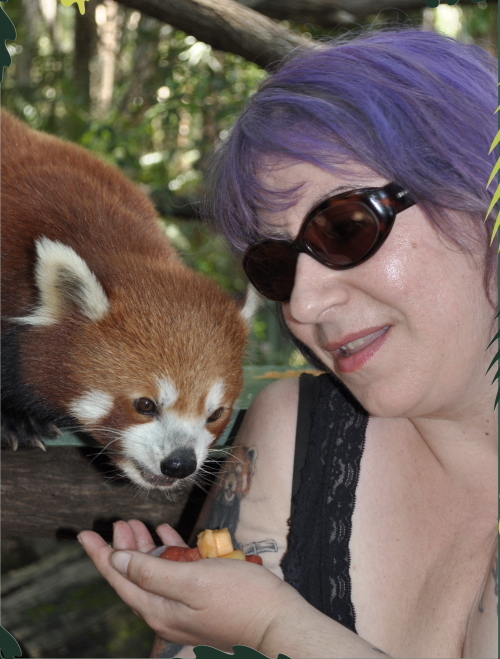 I first encountered the red panda at Melbourne Zoo and it soon became one of my favourites. Whenever I went to the zoo I would go see the red panda first and visit it again before I left. I loved its red fur and adorable face. I thought it looked like a fox in a tree. There is even an International Red Panda Day which is celebrated on the third Saturday in September. 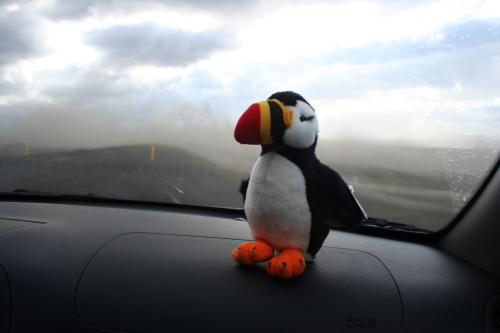 I became fascinated with puffins when I was lucky enough to go to Iceland for a holiday. Before the trip I researched the local fauna and thought they sounded interesting. When I first saw them on Grimsey Island I fell in love with their precious, serious little faces. They won my heart when I saw them fly. Their wings are so tiny that when they take off you think they are going to fall out of the sky. But they flap and flap those tiny wings and off they go! Two important animal organisations for me are The Red Panda Network and Project Puffin. Through them I sponsor a red panda and an Atlantic puffin. It is a lovely way to give back to these animals that have given me so much pleasure. Once again I have to say I absolutely love your photos and can’t wait to read on how snakes are linked to vampires, I don’t fear Dracula but have an incredible fear of snakes. Great names for the Wolfchildren, wonder what your favourite animal is? My favourite animal will be revealed very very soon! !